Mickelson confirmed Thursday a winner-take-all event against Woods will take place Thanksgiving weekend at Shadow Creek Golf Course. 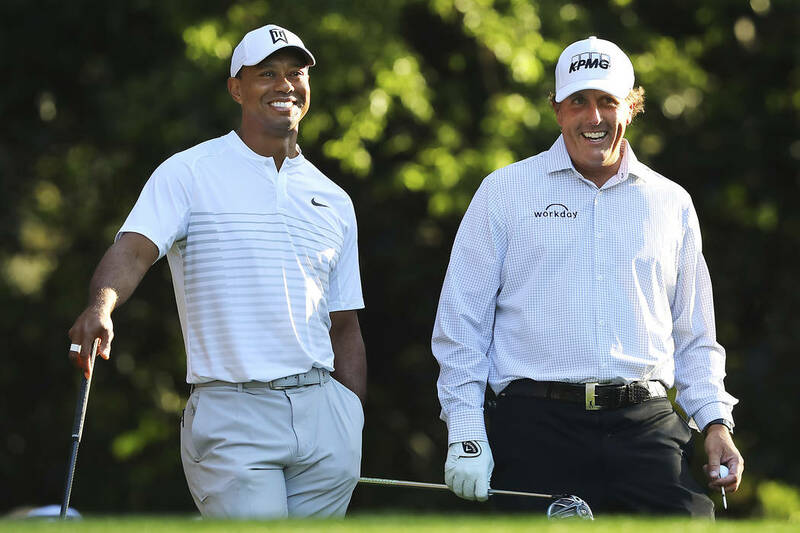 Phil Mickelson and Tiger Woods say they like to bet anything that makes them uncomfortable on the golf course. Ten million dollars should make them extremely uncomfortable. Mickelson confirmed Thursday a winner-take-all $10 million match against Woods will take place Thanksgiving weekend at Shadow Creek Golf Course. The match, which is expected to be 18 holes, has yet to be finalized, according to a source familiar with the negotiations but unauthorized to discuss them. The source said more time is needed before an official announcement can be made. No ticket information has been revealed for the event, whether the money would come from the golfers or sponsors and if it will be played Nov. 23 or 24. In July, the source told the Review-Journal expectations were for the match “to be held in the fall” at the North Las Vegas private course. Woods, 42, and Mickelson, 48, are the top two money earners in PGA Tour history. Woods ranks second all-time in tour victories with 79; Mickelson’s 43 wins rank ninth. They have been public in the last four months about their intent to play a made-for-television event against each other. Talk of the match was rekindled Wednesday when the pair played in a practice round together at the Firestone Country Club in Ohio prior to the Bridgestone Invitational. Woods was tight-lipped earlier Thursday after his round at the Bridgestone Invitational. Westgate sports book manager Jeff Sherman said he had planned to open Woods as a minus 130 favorite over Mickelson on Thursday morning for the proposed match. But he posted the price at minus 150 after watching Woods flirt with the top five en route to firing a 4-under 66 in the first round of the Bridgestone. “He just continues to blister on the course,” Sherman said. “He’s having a great year and he was doing great (Thursday). Mickelson also opened with a 66 at the Bridgestone. After taking a $2,000 limit wager on Mickelson at plus 130, the Westgate moved Woods to a minus 140 favorite and Phil to a plus 120 underdog. Sherman posted odds on four-day matchups between Woods and Mickelson at the U.S. Open and British Open, where Tiger closed as a minus 130 favorite. It won’t be the first time Mickelson and Woods have competed against each other in a made-for-television event. Between 1999 and 2005 and then again in 2012, Woods was a main star in the made-for-television primetime Monday Night Golf series on ABC. From 2003-05, Mickelson and Woods played against each other in the Battle of the Bridges in Rancho Sante Fe, California, a team event that was part of Monday Night Golf. In 2003, Mickelson and Sergio Garcia defeated Woods and Ernie Els 3 and 1. In 2004, Woods and Hank Kuehne defeated Mickelson and John Daly 2 and 1. In 2005, Woods and Daly lost to Mickelson and Retief Goosen 5 and 3.